I LOVE Nonni's Biscotti and it is such a lovely treat during the holidays...or anytime for that matter! 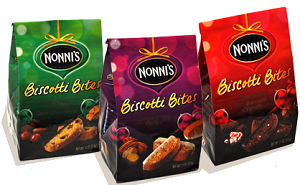 Right now through 12/31, you can enter daily to win a box of Nonni's Biscotti! Simply like their Facebook page and fill out the form! That's it! Please let me know if you are a lucky winner...I love giveaways! Enter today by clicking here.